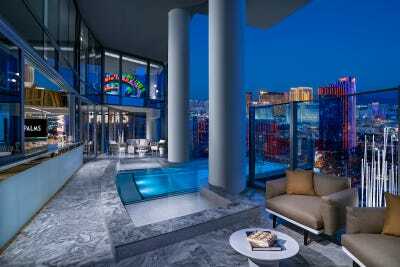 Palms Casino ResortA pool at the Palms Casino Resort in Las Vegas. High-profile gamblers, rejoice! 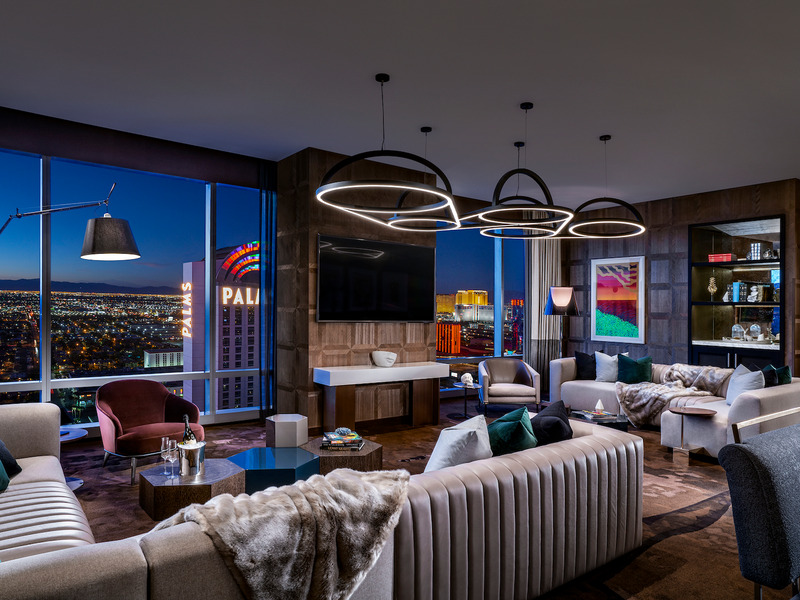 The Palms Casino Resort in Las Vegas is undergoing a $US620 million renovation, the most expensive in the city’s history. 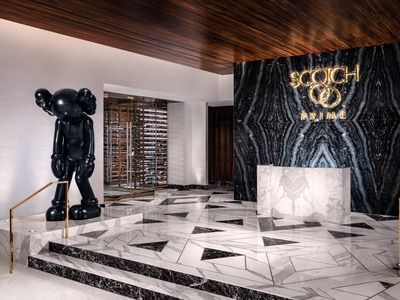 In 2016, the resort was bought by Frank and Lorenzo Fertitta, billionaire art collectors and fight promoters, for $US312.5 million, according to the New York Post. The two have since poured money into the resort’s $US40,000-a-night two-story villas, a $US3 million Scotch whisky inventory, a Damien Hirst shark in the lobby’s bar, and numerous other artworks from the likes of Andy Warhol and Jean-Michel Basquiat. 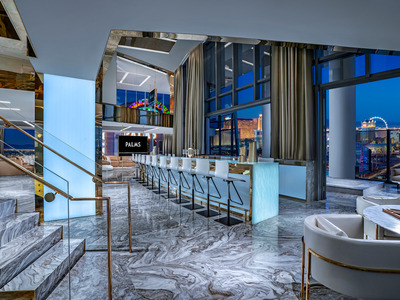 “By the end of the $US620 million renovation, Palms will be a completely transformed property making it one of Las Vegas’ most sought-after destinations,” the resort’s general manager, Jon Grey, said in a statement sent to Business Insider. It’s not all the reserve of the superrich, though. 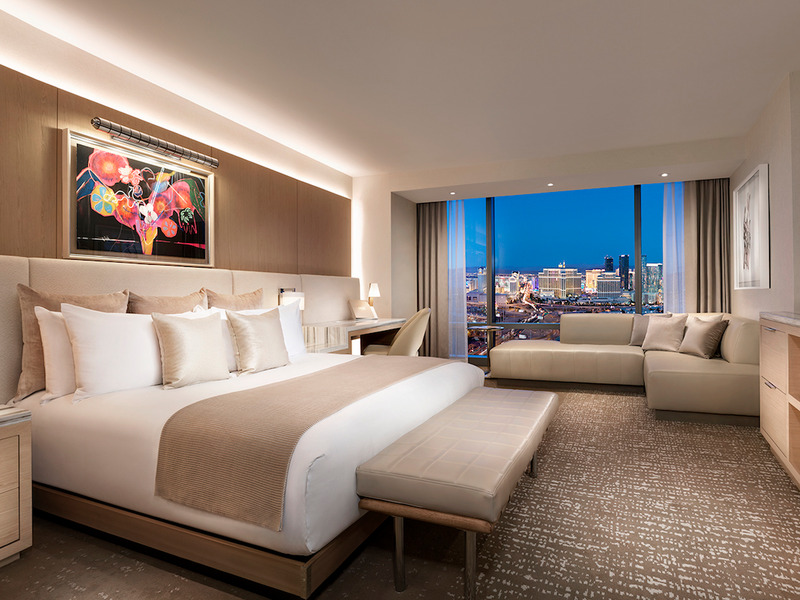 Resort rooms at the Palms start at $US139 a night, while suites start at $US199 a night. Here’s a look inside the mega-renovation. 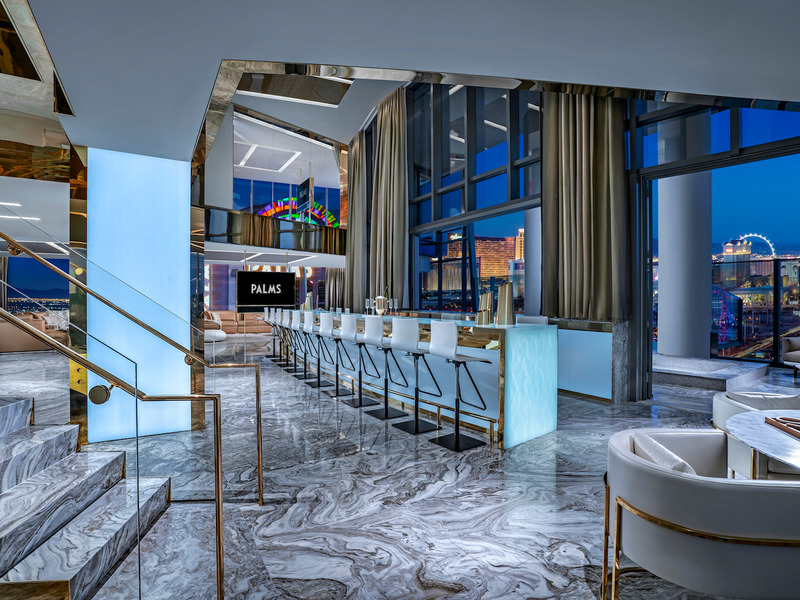 Palms’ new steakhouse, Scotch 80 Prime, offers “visually inspiring and engaging” dishes, such as a flaming Mesquite Fired Crustacean Tower and a Fire & Ice Banana Split. 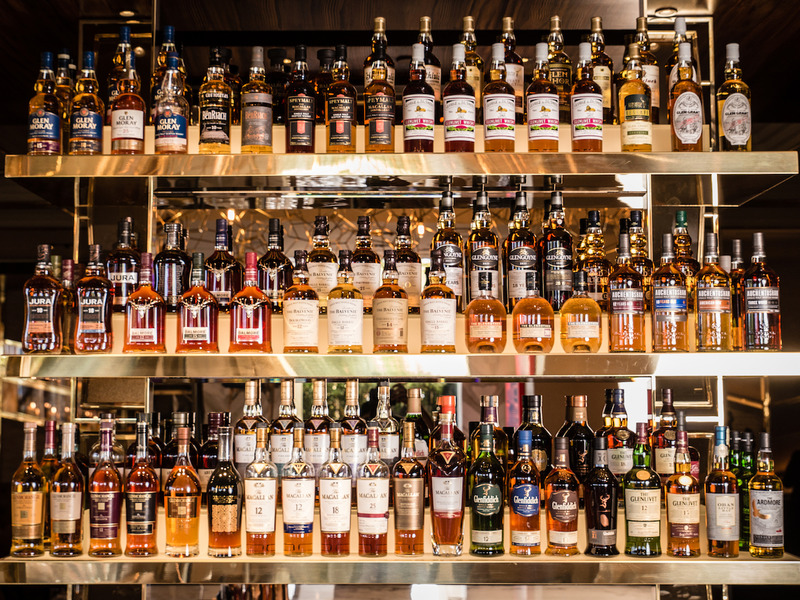 Palms Casino ResortThe Palm’s new steakhouse and whisky bar. It also has a $US3 million scotch inventory. 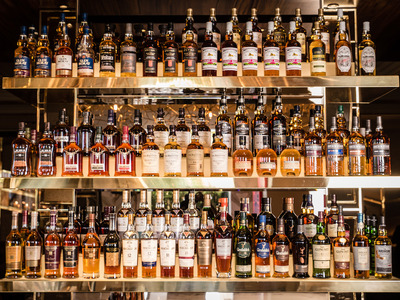 Palms Casino ResortScotch 80 Prime’s scotch inventory is impressive. 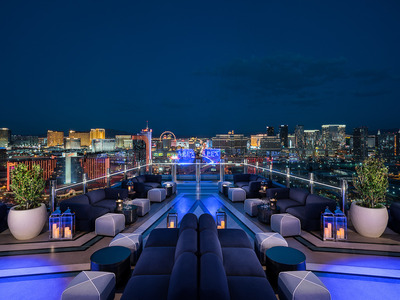 The resort’s rooftop nightclub, being rebooted as “Apex,” offers 180-degree views of the Las Vegas skyline. 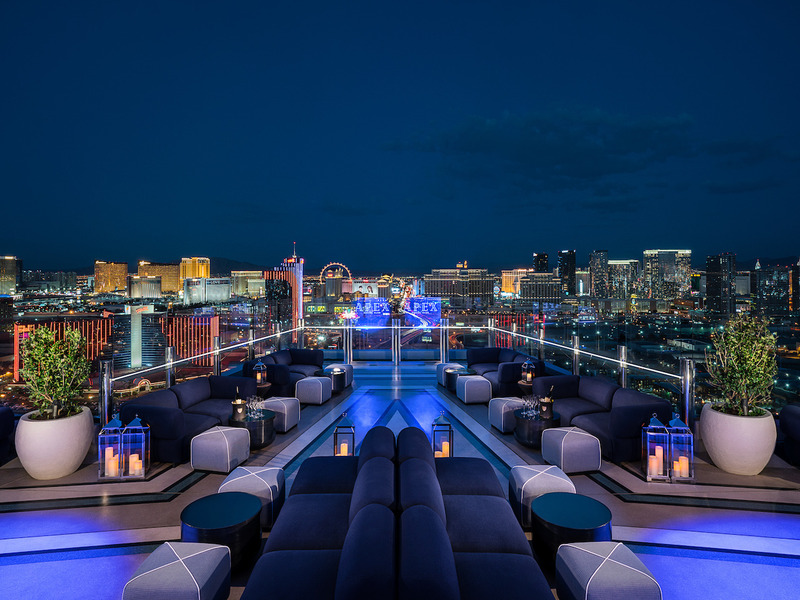 VIP bottle service is available for those who won big in the casino that day and for the celebrity clientele, such as Justin Timberlake. Palms Casino ResortThere are worse views in the world. The club’s four humanoid sculptures by the Brooklyn artist Dustin Yellin weigh 3,000 pounds each and are worth $US150,000 apiece. 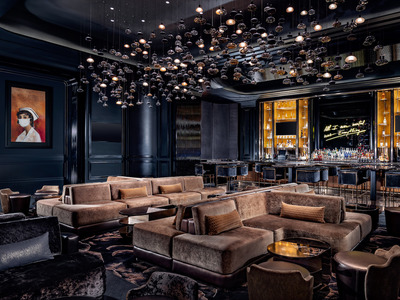 Palms Casino ResortApex’s interior is flanked by expensive artwork. 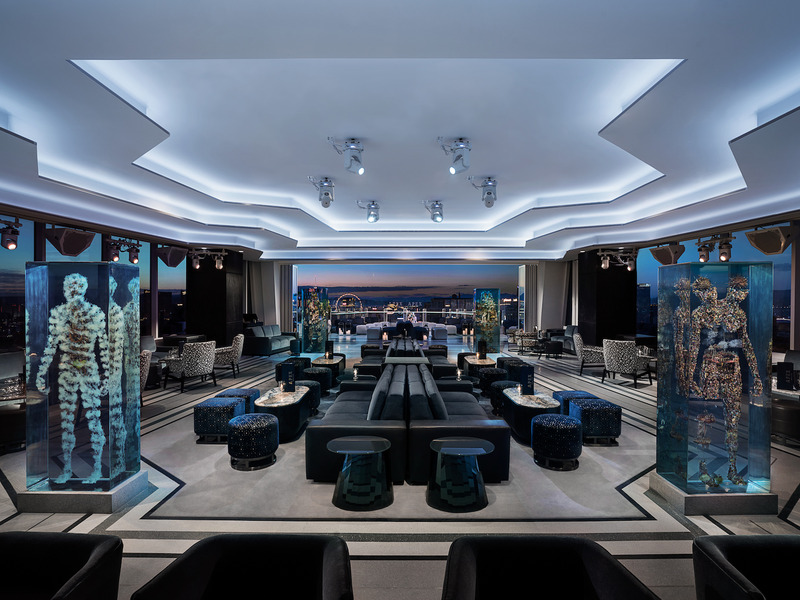 The New York Post described the Palms as “practically a modern art museum” since being taken over by Frank and Lorenzo Fertitta. 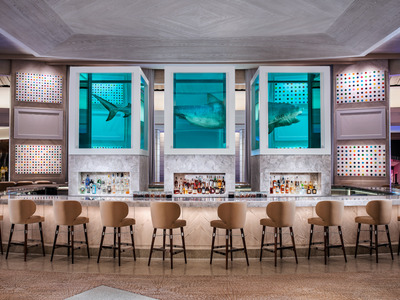 The resort features millions of dollars’ worth of original art from the likes of Andy Warhol, Jean-Michel Basquiat, and Damien Hirst, whose famous shark sculpture serves as the epicentre of the Unknown bar. 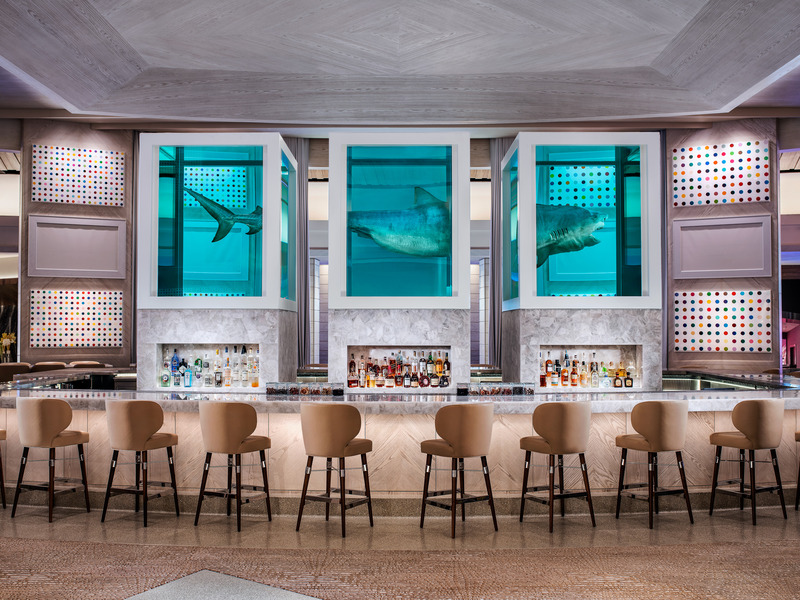 Palms Casino ResortDamien Hirst’s ‘The Unknown (Explored, Explained, Exploded)’ in the Unknown bar. Meanwhile, the Camden cocktail lounge features two Richard Prince paintings. 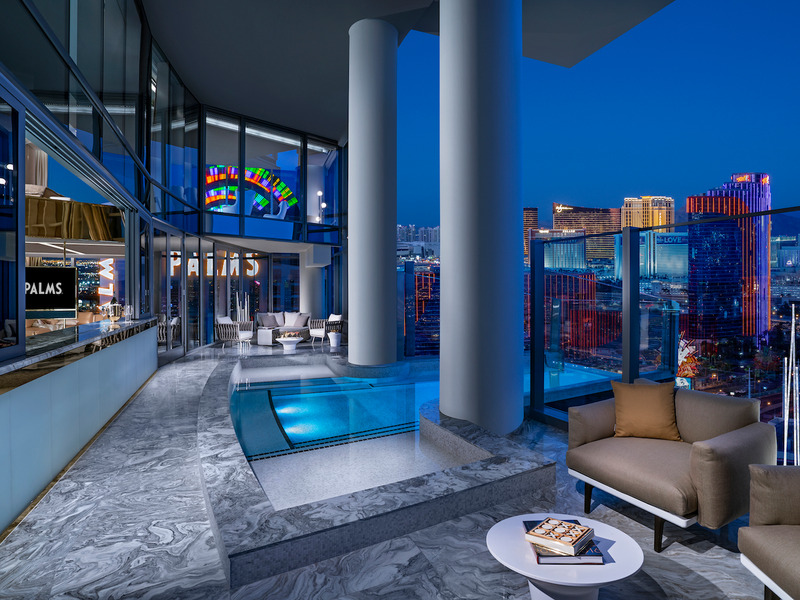 The hotel’s penthouses look straight out of “The Hangover” and come in what the Palms calls a “sensually masculine theme.” One-bedroom penthouses start at $US1,500 a night. 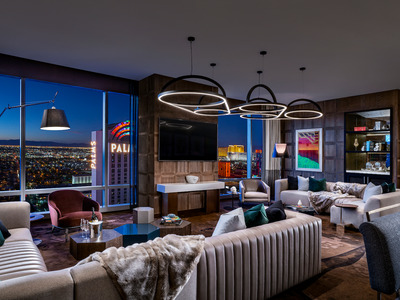 Palms Casino ResortThe penthouses feature a marble entrance and sepia-toned wood paneling. 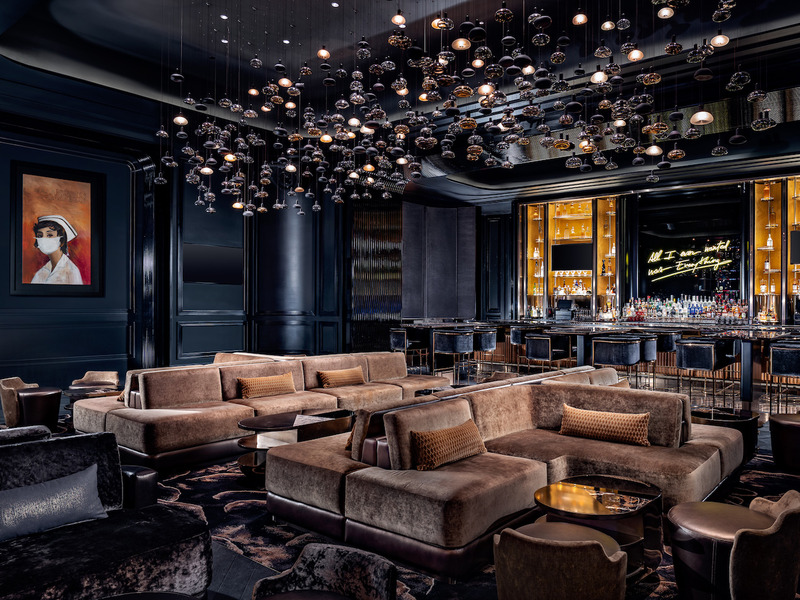 More artwork is incorporated into the rooms, with pieces by Jordan Nickel and Sam Friedman “adding vibrant energy to the room,” according to the hotel. 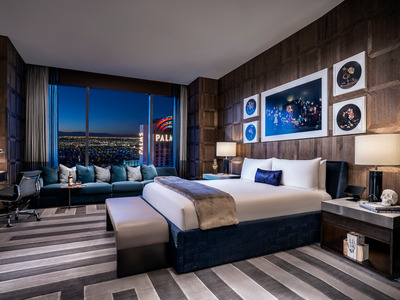 Palms Casino ResortThe bedrooms feature stunning views of Las Vegas. The hotel’s suites start at a comparatively affordable $US199 a night and include a full wet bar, marble countertops, and unobstructed views of the Las Vegas skyline. Palms Casino ResortThe Palms Casino Resort’s Grand Suite Bedroom. The jewel in the Palms’ crown, though, is its two-story sky villas, which you can enjoy for the princely sum of $US40,000 a night. Palms Casino ResortOne-story options are also available. The villas sprawl over 8,500 square feet and feature a cantilevered infinity pool with views of the Las Vegas strip. The residences also feature their own redwood cedar sauna, massage room, and fitness room. Palms Casino ResortThe villa is covered in marble.